The old jack on the boat was getting really hard to move and the bracket for my spare tire snapped in half! So off to Northern Tool I went and bought a new one of each. Which has an very clever locking mechanism for the tire. Both work very well and cost me a total of $69 out the door! WOOT! 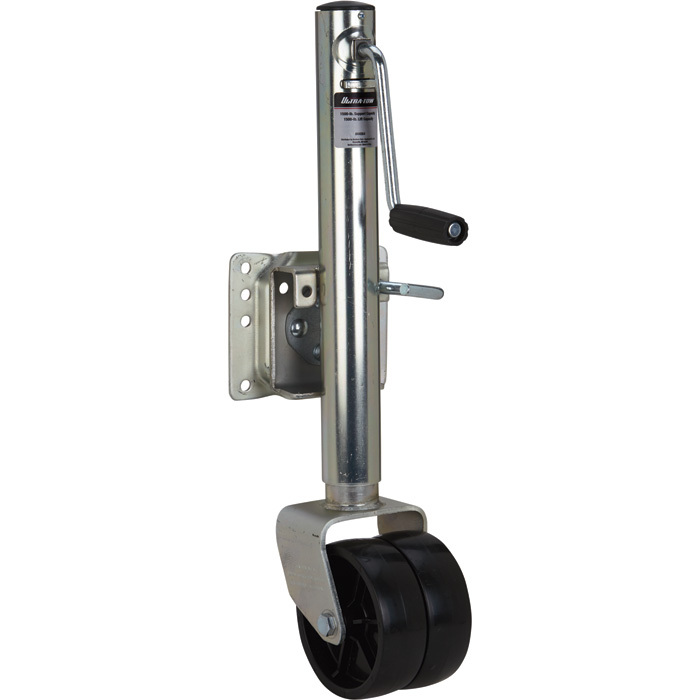 The jack goes much lower than the stock one, which is really nice as the place I park my boat at home has a slight hump, and was always a pain to get the stand rotated into its locking position to unhook the trailer. I also decided to swap the sides that the jack and spare are on. This way the spare covers up the old jack stand mounting bracket, and the jack stand is on the side nearest my house...and the tire cover will be more visible! The finished product with the all important Jetboaters.net tire cover! I am looking at the lock for the spare tire and can't figure out how it locks the tire on. Looks as you can just pull the bracket of the bolts. Decoy lock? i can't figure it out either. I had a similar spare tire lock on a Pwc trailer I just sold. Mine was backed by a ubolt not a separate mount. So the ubolt mounted to a trailer rail, the spare on it and both were locked down by the two screw on arms that you have pics of and locked together so they could not be removed. The difference being the ubolt was the mount in my case so there were no nuts to remove. FYI I have been using a simple bike cable lock for years with out issue. I am thinking those brackets are threaded on the one side and spin on to the stud independent of each other. Once locked, they cannot spin back out. Maybe?? 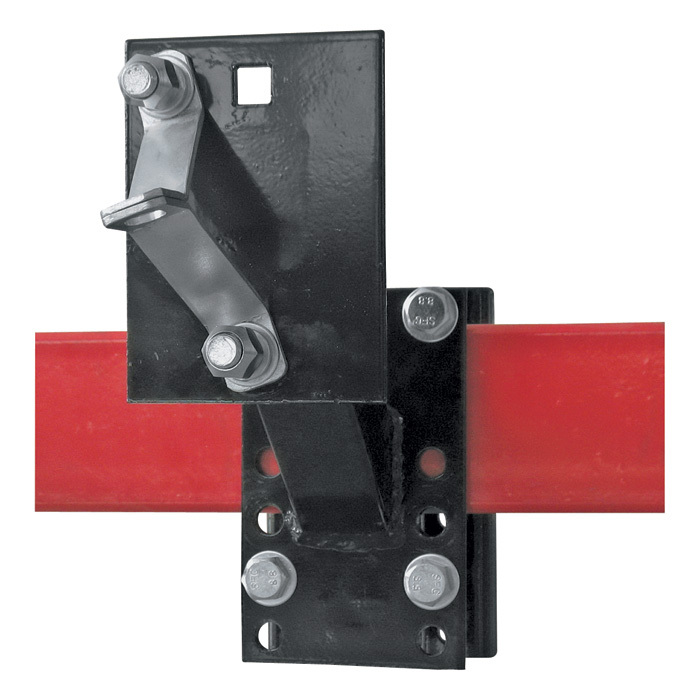 Just make up some new brackets, tap them and install on the bracket that connects to the trailer frame. You would need to replace the bolts as well and would need 2 of them. Boy, did I screw that last post up! @Julian just be careful with your spare on the drivers side, it would put you on the traffic side of a standard road while getting spare... Interested in how that jack holds up, looks like a great deal! 2010 Yamaha AR240 "Princess Ruby Jane"
@Bruce are there any covers left? I am sending the last blue cover to @Trm1765 then I will be out. Lets put another order together after the holidays. I have the same tire lock and yes it is threaded. Works like a charm.....I do need to switch to a combination lock as we already lost the key once and had to destroy a lock to get it off. Haha...I went with the keyed version with the thinking I would always have 1 key on my key chain and the other in my truck. I have too many passwords and such to remember that I couldn't do a 3 digit combo More power to you! We use these on our pool gates. Much easier to remember combo and you can set to any direction combination you like. 50/50 Owner of Gantlin Products LLC. , Producer of "The Wake Wedge" for Yamaha jet boats. 2017 242X , (2 ) Polk 4000.4, JL Audio M600/1, Wetsounds SYN-DX-4, Ws-420 SQ, Wetsounds rev10's, (2) JL Audio M10IB, JL Audio MX650 (6), Wetsounds core 10 sound bar, Keel Guard, Wake Wedge, Warbird chariot 3 tube, Phase 5 oath, Shred Stixx Truckster, Byerly Volt, Ronix District , and a couple of knee boards. Fishing rig: 1988 Aluminum Lowe flat bottom fishing boat with 30 horse Johnson outboard. Thats a nice lock setup. I just drill a 3/16" hole thru the stud and put a padlock through it. I am considering getting a jack with no wheel. I don't/can't wheel the boat around anyway. Thoughts? Cam. Boat: PPass, Pinned, Finned, Noodled, 2000lb Auto Ballast, SS Scupper, Inflator, Tow Valves, Custom Anchor. Trailer: Welded Bowstop, Re-wired, LED lites, Backup lites, F2 Winch, F&R Boat Buckles. For me, the wheel provides a little bit of flexibility to get the ball close to the tongue and move the tongue over the ball while lowering the jack. I have other trailers without wheels on their jacks but I do not hook up to them as frequently. I find the wheel very useful too! This jack is working awesomely so far, and for only $45! It is way smoother than the stock jack and is rated for 1500lbs. If it lasts 1/2 as long as the stock one I'll get a good 4 years out of it!